Gumbo is an excellent old-school example of American fusion cuisine. Various traditional recipes include okra brought from Africa, American ingredients like tomatoes and bell peppers, the Native American influence of sassafras, and traditional French cooking methods. While some purists might scoff at a version without meat or seafood, we think even the staunchest Cajun would enjoy a bowl of this tasty and hearty vegan gluten-free gumbo. Prepare a roux by melting the butter substitute in a medium pan over medium heat. Once melted, reduce temperature to low and whisk in rice flour. Cook and continue whisking until the roux has a thick texture and smells slightly nutty, about three minutes. Remove from heat and set aside. In a large soup pot saute onions, garlic, bell pepper in olive oil over medium-high heat until the volume reduces and onions are nearly translucent, about 5 to 8 minutes. Add okra, tomatoes, and allspice berries to the saute and stir. 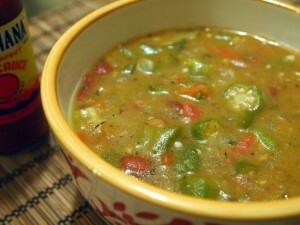 Reduce heat to low and allow okra to soften, stirring frequently, about 10 minutes. While the okra is cooking, return the roux to low heat and whisk in 2 cups of stock. It should have a thick, creamy texture without chunks. Add the remaining stock and the roux to the gumbo. Add oregano, thyme, bay leaves, paprika, cayenne, and black pepper. Cook the gumbo for 20 minutes over low heat, stirring frequently. After the gumbo has simmered, stir in filé powder and remove from heat. Serve over prepared rice with your favorite Louisiana hot sauce.